MacDonald, David. An Introduction to the History and Coinage of the Kingdom of the Bosporus. [Classical Numismatic Studies, No. 5]. Lancaster, PA & London, UK , 2005. (GR 311). Between the seventh century BC and the fourth century AD, the Cimmerian Bosporus, an area covering the Crimean and Taman Peninsulas of southern Ukraine, consisted of a vigorous and sophisticated culture that maintained close ties to the Greco-Roman world. Much of what is known about this region comes from the coins struck by the local cities as well as the Kingdom of the Bosporus, initially independent, but by the first century BC, a client-kingdom of Rome. Apart from N.A. Frolova’s The Coinage of the Kingdom of the Bosporus: AD 69-238 (BAR 1979), now out of print and difficult to obtain, much important original research done by Russian and Ukrainian scholars remains largely untranslated and inaccessible to English-speakers. To fill the need for a satisfactory English introduction, David MacDonald has written An Introduction to the History and Coinage of the Kingdom of the Bosporus. Drawing from Russian and Ukranian sources, An Introduction to the History and Coinage of the Kingdom of the Bosporus offers a systematic, chronological overview of the region’s coinage by the major coin-types, arranged by regnal and Bosporan Era years, of the Bosporan rulers from the Archaeanactids at Panticapaeum in 480 BC to Rhescuporis V, the last Roman client-king of the region. Regional maps and figures of specific reverse types for the early silver issues, and important regnal monograms, as well as an Appendix covering re-engraved bronze coins round out the text. A Concordance of the major references, and a Select Bibliography provide springboards for numismatic research. 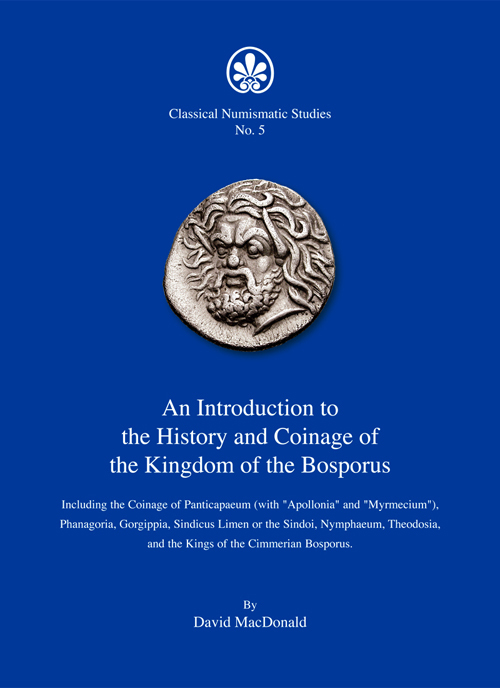 An Introduction to the History and Coinage of the Kingdom of the Bosporus is intended to be a general accessible numismatic vade mecum for numismatists, beginning collectors, and the academic non-specialist. DAVID MACDONALD, California State University, Fresno (BA 1965); University of Minnesota (MA 1968; PhD 1972), is Professor of History at Illinois State University. He has published numerous articles and several books on history, epigraphy, and numismatics. His most recent numismatic publications include: “Thasian Tetradrachms Overstruck on Athenian New Style Tetradrachms,” Nomismatika Cronika 22 (2003); “Sicilian and Southern Italian Overstrikes on Pegasoi,” Nomismatika Cronika 21 (2002); “Macedonian Civic Bronze Overstrikes and Circulation Areas,” Nomismatika Cronika 19 (2000); and The Coinage of Aphrodisias (1992). He is an honorary life member of the Hellenic Numismatic Society, and a member of both the Schweizerischen Numismatischen Gesellschaft and the American Numismatic Society. Published by Classical Numismatic Group.Dealer inquiries invited.